My hair is dyed gray now and It's been a struggle to find a good eyebrow product that's cool toned enough to work with my hair without being too dark. I'm so excited to have found the VOV Auto Style Eyebrow Pencil. This one is just perfect. Its oval design at the tip of the pencil and also consistency of the pencil's product allows for drawing lines that are just right. I chose the #12 shade which is in Gray because I want my brows to look natural and subtle in contrast to my gray hair. The packaging is something you'd find in typical Korean brow pencils. It's a double-ended brow pencil with a spooley. The pencil itself is retractable so you don't have to sharpen it. It comes with a spooley on one end which comes in handy to blend out. And it's actually useful, at least for me. No need to pick up a separate brush just for blending. The texture is really, really soft. Almost too soft. I prefer harder formulas as they give perfect color payoff, but softer formulas like this are easier to apply. I do like the application with this. I only have 30 minutes to get ready in the morning and doing my brows in less than 5 minutes is no easy task. With this, it's easier to get the shape I want without much time and effort. The formula is waxy and glides on smoothly without being chalky. The color payoff is great! For me, it's the perfect amount. The pigmentation of these pencils is just right for me. I don't like using super pigmented brow pencils! It's easier for me to build up color than to erase when too much is applied. As for the longevity, I wear this from 8 AM to 3, sometimes 5 PM and there's no fading whatsoever. I've never had issues with this one. So, longevity is no problem with this! My favorite brow pencils are oval-shaped ones. The tip makes it easy to mimic brow hairs, especially for straight brows. For this product, the tip is oval but it's also kind of like a mini triangle. The thinner end is great for outlining, while the thicker end is better for filling the gaps between your brow hairs. I don't teach how to draw a perfect eyebrow because I'm still a beginner and everyone has own skill. 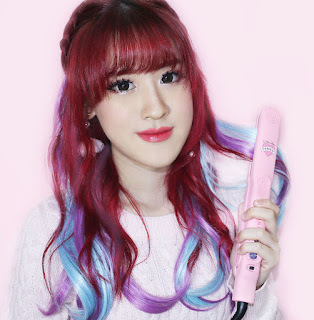 You no need purposely looking for branded products, you can use any product as long as it's similar and it's really good. 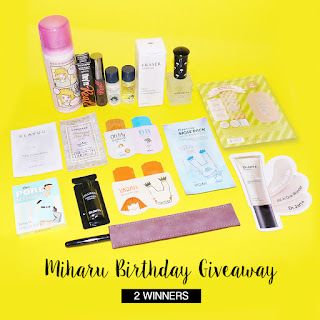 Don't forget join Miharu Julie Birthday Giveaway!! You look lovely in these photos <3 I really like the way your eyebrows came out. Great review. Have a lovely weekend. this eye pencil seems lovely, too bad it is too soft! This pencil looks so interesting. Love it.